This interview was made in 2014. Since then a lot has changed. We will keep you updated with new interview coming soon! Midigama is a tiny fisherman’s village in the South of Sri Lanka, 160km from Colombo. If you are in the right place you will smell it straight away – people are drying fish everywhere! 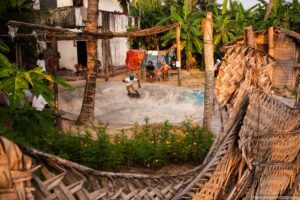 Midigama is becoming a popular place to stay, mainly due to its four surf spots, and over the past few years a number of hotels / homestays have appeared. Back in 2012, 4 friends came to Sri Lanka for their holidays, surfers/skateboarders who had met before in Belgium. 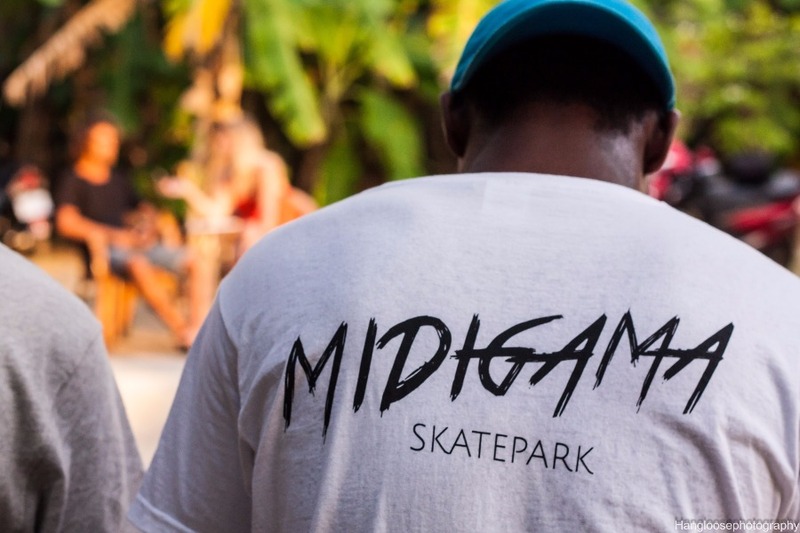 Soon Rutger Embrechts, Arno Van Elsen and Brazilian brothers Henrique Figueiredo and Bernardo Figueiredo embarked on a project to keep themselves busy during flat days – Sri Lanka’s first Skatepark! I spoke with Bernardo about how the project came about and what the plans are for the future..
Hey Bernardo, can you tell me something about your project? It started in 2012 and in the beginning it was just a surf trip with my friends. 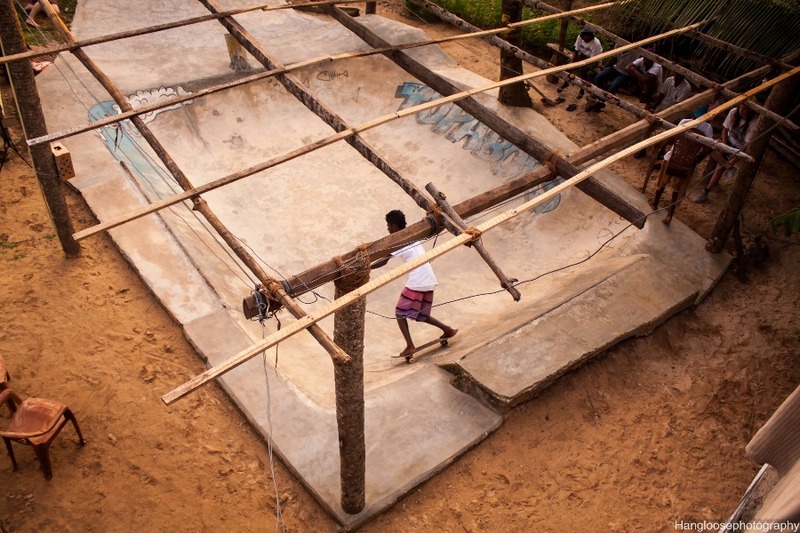 When there was nothing to do on the flat days my friend Arnold got the idea to make a small skate bowl for us and the local boys to fill days without waves. We started to raise some money to build up the place as soon as possible. We choose Chari´s land because he is our friend and as you can see his family hasn´t got so much. We wanted to attract tourists so the family could slowly earn some money. There wasn’t even a water connection in the beginning. This was the first year of the project. On the second year we came back and people seemed to like the idea so we decided to set up a small campaign to raise money. With the help of coffeePoint, other places around Midigama and many other people we raised enough money to make what we have now and we are also setting up a small shop next to the park. No no, we just want the family to sell water for skateboarders and other people passing by the skate park. They have bananas and coconuts in their garden they could sell as well. But like I said they also have to do something for it. We cannot do everything for them. So slowly slowly we are doing everything as we planned. Who is teaching the boys to skate here? Are they doing it by themselves or are they watching foreigners? Now, yeah… they are just trying. They watch foreigners coming a lot here in season and copy their skateboard skills later. Every day when I ´m passing by local guys are skateboarding. So it works, you know? It’s just the beginning of skating in Sri Lanka. And there are people coming here from all over the world. So it’s nice. Where do they get the skateboards from? And other equipment? Everything comes from donation. They don´t need shoes just skateboards. Actually this whole project is supported by donations. There is no skate shop in the whole of Sri Lanka. Where are you getting the donations from? From Europe or from here? Mostly from Europe but we’ve also got some tourists who visit with skateboards and they just leave their skateboards here for the local boys – so that’s also very cool. Do you think the boys have any chance to travel out of the country/island because of skateboarding? Yes, I am 100% sure they can. Because Sri Lanka does not have any skaters, so it’s a nice opportunity for any brand to catch them. You know, somebody might come and give them a chance to go to a contest or something. Actually, we already had some contests. Do you have any idea how many locals are skateboarding here? Maybe around 20 skaters. From our group there are four boys skating here every day. Then there are boys coming from Weligama and Galle. 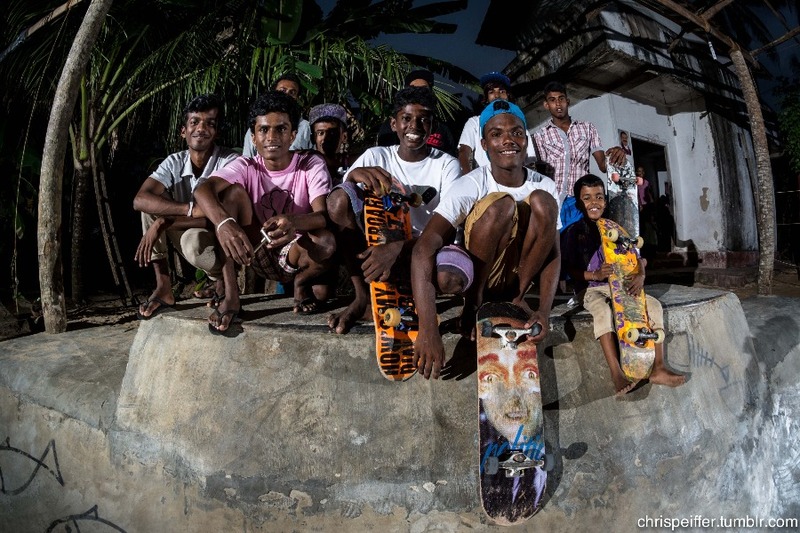 There is also a group from Colombo – Push skateboards, they have a really nice project and they are fighting a lot to build the first skate park in Colombo as Sri Lanka doesn´t have any official skate park. 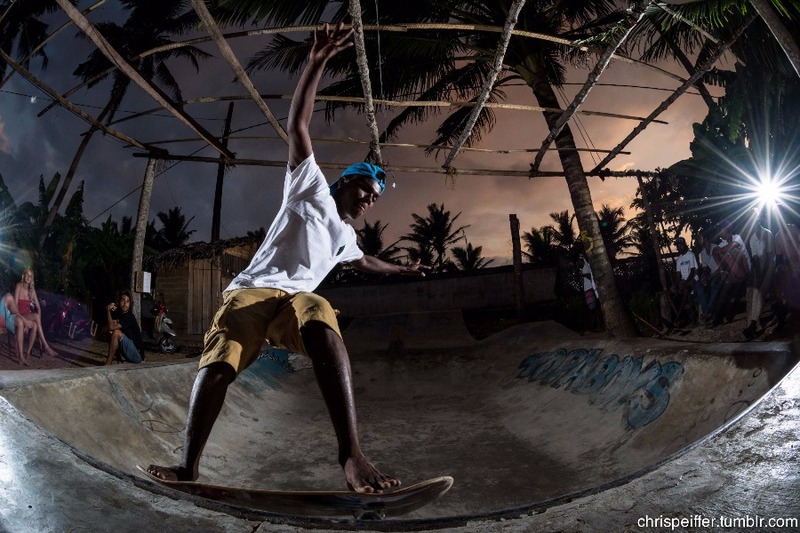 Our skate park is the first one in Sri Lanka. So, you must be so proud of you! Do you also do skateboarding? Yes, we are! I´m not skateboarding, I´m a surfer, heh. This all happened because of my two friends who skate. Why did you choose Sri Lanka? Why not Bali or I don’t know… other more popular places? I did a world trip and I started in Sri Lanka. Since the first moment I thought Sri Lanka was the best country to do something. I traveled and traveled and traveled and I still had the same feeling to come back here. So everything started only as a hobby just to do something for locals. At the end I came back and I felt better and better here and I saw the boys also growing up and skating better. They are changing their lives because of skateboarding. I can already see the change in them. How did you get a land? Aren´t you afraid they will kick you out one day? No, I´m not afraid. Of course, it might happen. But this family is very proud to have a park in their garden. Chari, he is one of the kids skating here, owns the land. Maybe that´s also why I have the feeling Sri Lanka is the right place to run our projects. I just trust people here. Beside the skate park project we also have a Surf club which has the same idea – we are giving surf lessons to local kids but we are still working on it getting donations because we need surfboards and we need equipment. And who built this skate park? Did you build it by yourself or did you employ some workers? We did it by ourselves, local boys built it, Asanka, Chari .. everybody helped a little bit. We just needed a professional guy in the end to make the concrete smooth. And do you remember how many concrete bags you needed to build the skate park? Yes, it was 150 concrete bags for the skatepark! How does the skate park look like when it’s off season? It’s raining a lot here so doesn’t it turn into a proper swimming pool then? That´s why we are fixing the roof again because the old one was broken. But you couldn´t really skate in the off season. The family was working hard to scoop out the water from the pool so we want to fix it better to have an all year round skate park. We are still helping all families. Everyone has problems and sometimes it´s difficult to choose. We don´t want to give them just money. We also want to give them opportunities and push them to do something more and work. Pictures by Leonel Graner and Chris Peiffer.